Michele and Jim chose the beautiful Sandpearl Resort on Clearwater Beach as the Venue for their wedding ceremony in early October. The weather did not cooperate, nevertheless they persisted and the couple had a beautiful custom ceremony. 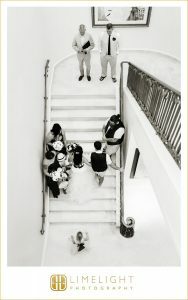 Michele looked stunning as she was escorted up the lobby staircase by her son to join Jim on the landing. There, with their family and friends gathered at the bottom of the stairs, the couple shared their vows, exchanged rings, and were pronounced husband and wife by Rev Rick Lackore of Sensational Ceremonies. Floral provided by 2Birds Events; Ceremony Music and Sound provided by Michael with Grant Hemond and Associates and Venue and Event Coordination provided by Jennifer and the rest of the staff at the Sandpearl. Special thanks to Wedding Photographers Dafne and Audrey with Limelight Photography for providing this photo during their ceremony. Congratulations to the new Mr. and Mrs. Jim Leaman!